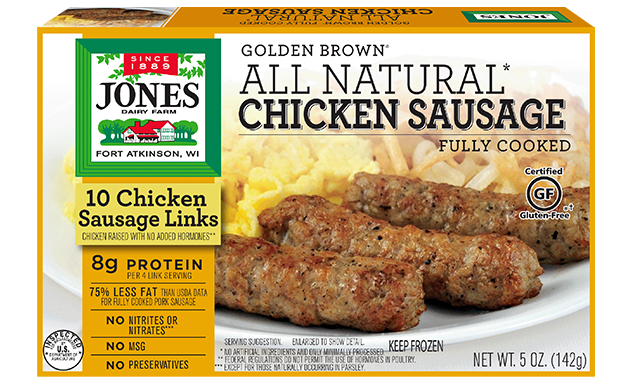 Our new chicken sausage links boast the unmistakable Jones flavor with a fraction of the fat. Made with all-natural ingredients, each serving of these certified gluten-free chicken sausage links contain 9g of protein and ​60% less fat than fully cooked pork sausage. And because natural ingredients taste better, we never add MSG, nitrites or preservatives to our products. Like all of the breakfast sausages in our Golden Brown line, our chicken sausage links are fully cooked and easy to prepare. Look for them in the frozen section. Keep frozen. For best flavor use within 30 days. Heat chicken sausage ​links on MEDIUM (50% power), using microwave-safe plate lined with paper towel, for times shown, or until heated through. Place chicken sausage links in preheated skillet over medium heat for times shown, or until heated through. Turn occasionally for even heating.